Once upon a time, there was no such thing as National Novel Writing Month. And then there was. As NaNoWriMo became the hip plea for see me, see me, I exist, feted by NPR and TV news ‘n’ stuf, it begat National Poetry Writing Month, which begat National Haiku Writing Month, which begat Script Frenzy, which begat Phinehas, Phinehas begat Abishua, and Abishua begat Bukki. In all this word salad, photographers felt totes jelly, so they begat SOFOBOMO, the National Solo Photo Book Month, which doesn’t even have an “F” in it, showing you exactly how bad photographers are at speling. And because photography is less respectable than writing haiku and tanka and limericks and stuff, eventually it petered out for lack of prestige and paper awards. In its time, though, some pretty good books came out of it. 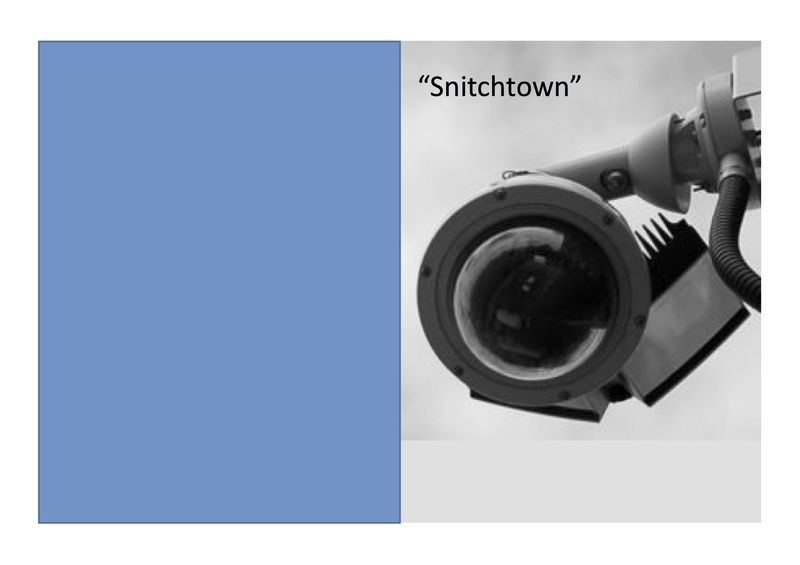 This one is a kind of photo-essay about living in a surveillance society that uses Cory Doctorow’s essay “Snitchtown” as a starting point by connecting the words to some images of the 4.2 million CCTV surveillance cameras in Great Britain. Sleep tight, knowing that this will never happen in America.